Get to know the ORSP. The Office of Research and Sponsored Programs will host an Open House, Friday, Sept. 15, on the fourth floor of Loretto Hall (rooms 423 - 431). 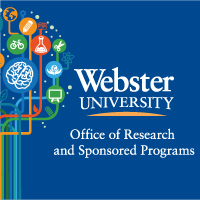 Drop in for a quick, calming break from the excitement of Homecoming to enjoy refreshments, meet ORSP staff, test drive a grant search engine or two, and chat about grant-seeking support and opportunities at Webster. Webster’s $2.7 million grant from the Department of Education, a grant project under the leadership of School of Education associate professors DJ Kaiser and Yin Lam Lee-Johnson. Mendeley Workshop: Learn about the reference manager and academic social network that can help you organize your research, collaborate with others online, and discover the latest research. Workshop occurs Wednesday, Oct. 11 in Library Conference room (12 p.m.-1 p.m.). Apply by Monday, Sept. 25, for the Creative Inquiry in the Arts and Humanities Institute, which will be hosted at The Lincoln University, PA, Nov. 10-12, 2017.